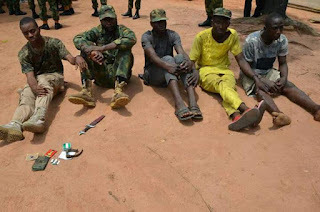 In the continuation of the crack down on criminal elements, the troops of the 81 DIVISION NIGERIAN ARMY arrested some imposters of the Nigerian army at the Lagos and Ogun part of the country. 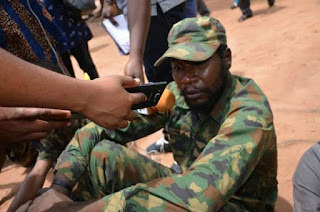 The experience of the Division reveals that most of the people in military uniform that were arrested by the crack team of Operation CHECKMATE while extorting innocent citizens, interfering in land disputes, perpetrating one criminal act or the other actually turned out to be impostors who are unduly and deliberately tarnishing the good image of the Nigerian Army by committing such crimes while impersonating military personnel creating the false and unfortunate impression that such criminal acts were being perpetrated by soldiers. Mr. Olarewaju Yusuf of No. 5 Idowu close Ojo-Alaba Road was arrested on 11 April 2018 for impersonating as a soldier. He was in possession of an Army camouflage cap, claiming to be an Air Force personnel. Mr. Ibrahim Isa aka “Malaika” was arrested on 15 April 2018. The suspect usually claims to be a soldier in order to commit criminal acts. Mr Ibrahim Abdullahi, a dismissed soldier was arrested on 15 April 2018 for assault and impersonation. Mr. Ale Victor Michael of No 3 Tony Marshall Street, Ajasakoma Ipaja. He was arrested along Iba Road on 14 April 2018, dressed on Military Camouflage T-Shirt and Desert boot impersonating as a soldier. Items found in his possession are; 1 Nigerian Army Badge, 2 Camouflage T-Shirts, 1 Daga knife, 1 Royal Ranger ID card, 1 Lieutenant Rank and 2 Nigerian Army Letters of Recommendation. The General Officer Commanding 81 Division Nigeria, Major General Enobong Okon Udoh wishes to use this opportunity to thank the general public and indeed the people of Lagos and Ogun states for their continued cooperation and urges them to always give timely information that will help the Division in its operational efforts on day to day basis. He pledged not to relent until the Area of Responsibility of his Division is completely rid of all forms of cultism, vandalism and other violent criminal activities and criminal elements. He enjoined members of the public to continue to always reach out and call the numbers below or contact the nearest military barracks for timely useful information. You are please requested to disseminate this information through your widely patronized media. Thank you for your usual cooperation.